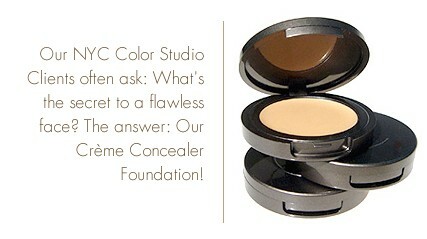 When we created our signature Crème Concealer/Foundation formula, we had one mission in mind: it must look like SKIN! No telltale lines of demarcation. No heavy, cake-y look. Simply, an easy-to-use pro-performance formula that reveals a gorgeous you! Our unique, multi-tasking formula can be customized for the coverage that you need: apply it to cover up dark circles and blemishes, medium coverage for a camera-ready finish, or sheer coverage to even out the complexion. It’s beautiful on all skin types, skin textures, and with 10 expertly-designed Ready To Wear shades and Custom-Blending available (of course!) we have the right shade for you! The only Concealer you'll ever need - Concealer, Foundation, Lipstick base and Eye Shadow Base all in one! Click here to learn more about skin tone and to view our models if you haven't already!